The McLaren 675LT finished in the iconic McLaren Orange, was at our North Yorkshire studio in Harrogate for a number of our services. 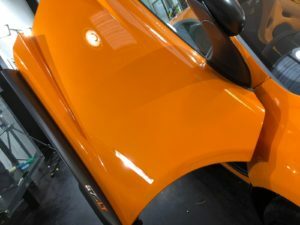 After undergoing our 22 stage decontamination process, our detailing team used compound enhancement machine polishing techniques to remove heavy swirls and imperfections in the paintwork. 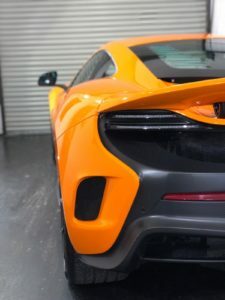 Once the paintwork had been fully corrected, our technicians got to work installing pre cut self healing paint protection film to the bodywork. In addition to PPF, GTechniq Ceramic Total Surface Protection was applied to the entire vehicle which includes: brake callipers, alloy wheels, all exterior paint, exterior glass and all interior surfaces. Our technicians use a small cotton pad and work on small square sections of a panel until the whole area is protected. This specialist sealant will keep it looking glossy and new, prolonging the life of the paintworks perfect finish. 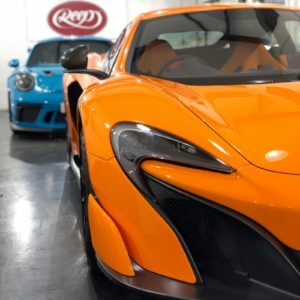 Our detailing studio in Harrogate, North Yorkshire has clean rooms designed for the application of LLumar and Premium Shield’s self-healing Paint Protection Film. The same applies when we’re applying Gtechniq’s Ceramic Sealant onto your car. The environment in which these protectants are applied needs to be as clean and pure as possible.